Tá an-suim agam i stair na hÉireann, ach rud amháin a thug mé faoi dheara go minic ná an laghad tagairtí don Ghaeilge a bhíonn i leabhair staire. De gnáth is fo-nóta atá sa teanga, déantar tagairtí anseo is ansiúd dó ach sin é. An sampla is measa den nós seo a tháinig mé ar riamh ná an leabhar meánscoile – Focus on the Past 2. Foilsíodh an leabhar seo in 1990 - níl a fhios agam an bhfuil sé fós in úsáid, ach tá súil agam nach bhfuil. 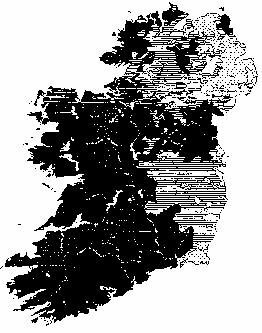 Clúdaíonn an leabhar Teastas Sóisearaigh stair na hÉireann agus na hEorpa ó 1450-1850. Leagtar béim ar stair shóisialta agus eacnamaíochta mar aon le stair pholaitiúil. Déanann an leabhar a mhúineann stair do pháistí na Poblachta éagóir uafásach ar an nGaeilge. Tá níos mó ráite ann faoin Réabhlóid Tionsclaíoch ná an Ghaeilge. Tá dhá thagairt don teanga - mír an-bheag ag an deireadh faoi thionchar an Ghorta ar an teanga agus píosa faoin difríocht idir an cultúr Gaelach agus an cultúr Sasanach ag deireadh na meánaoiseanna. Ní hamháin nach bhfuil mórán ann faoin nGaeilge (nó faoi mheath na Gaeilge – ceann de na hathraithe sóisialta is mó is stair na hÉireann) tugann sé eolas míchruinn faoi bheocht na teanga freisin. 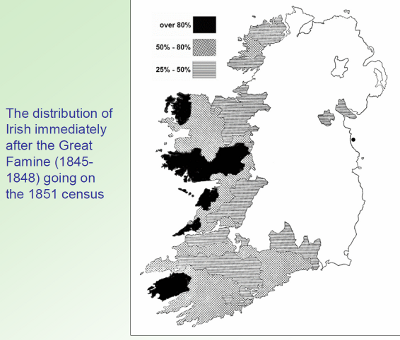 Breathnaigh ar na léarscáileanna thíos, na cinn a dhéanann 'cur síos' ar staid na Gaeilge in 1851 agus 1891. Dóibh siúd le cur amach acu ar bheocht na teanga sa lá atá inniu ann, is léir cé chomh míchruinn is atá an cur síos seo. 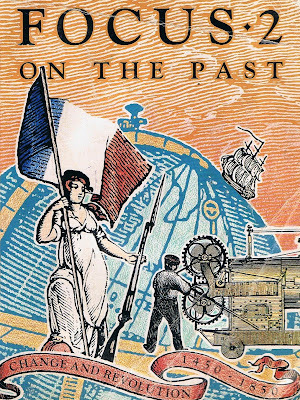 Cén áit as ar tháinig na maíomhanna in Focus on the Past? Is ó Dhaonáireamh 1851 agus 1891 a thagann siad. Seo léarscáil a léiríonn na háiteanna sa tír ina raibh Gaeilge ag ar a laghad 25% den phobal de réir Daonáirimh 1851. An bhféachann sibh cén áit a bhfuair Focus on the Past an fhaisnéis - ceantracha ina bhfuil Gaeilge ag 80% den phobal amháin atá curtha sa leabhar – sin an ciall le “Areas where most people spoke Irish” de réir dealraimh. Déantar neamhaird ar na ceantracha eile ina raibh Gaeilge ag formhór an phobail. Baintear úsáid as an gcleas céanna le daonáireamh 1891. N'fheadar cén fáth gur cuireadh an t-eolas míchruinn seo os comhar páistí méanscoile, ach is náireach an scéal é gur tharla a leithéad. Tá sé deacair teacht ar shonraí faoin leabhar, ach de réir na bileoga seo ón bhfoilsitheoir, Gill & Macmillan, bhí an chéad eagrán de Focus on the Past á mhúineadh go 50% de pháistí na Poblachta. 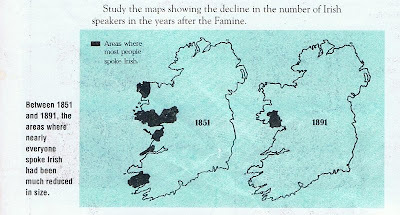 "Study the map showing the decline in the number of Irish speakers in the years after the Famine," a deir an leabhar. Cén teachtaireacht a thugann na léaráidí míchruinn seo do pháistí a dhéanann staidéar orthu? An teachtaireacht a fhaighim uathu ná gur beag baint a bhí ag an nGaeilge le formhór na tíre le fada fada an lá. Má chreideann páistí nach raibh Gaeilge á labhairt ina gceantar leis na cianta, tá baol ann go gceapfaidh siad nach bhfuil ceangal acu féin leis an teanga, agus níos lú seans go mbeidh fonn orthu í a fhoghlaim (rud a tharlaíonn i mBaile Átha Cliath). Mar a dúirt an fear – an té a bhfuil smacht aige ar an am atá caite, beidh smacht aige ar an am atá le teacht. Anois cuir an éagóir i gcomhthéacs measúnaithe eile ar bheocht na Gaeilge, mar shampla an ceann seo ó 1800. Níl a fhios agam cén faisnéis a úsáideadh don léarscáil seo, ach is dócha go gcuireann an easpa eolais atá againn faoi bheocht na Gaeilge roimh an nGorta leis an bpointe faoi bhánú na teanga ó stair na hÉireann.